Written by Peter-Christoph Haider on 01/15/2019. You think e-mail is dead? The recent research facts prove that it's actually on the rise. The problem might be in its ability to meet the changing user needs. 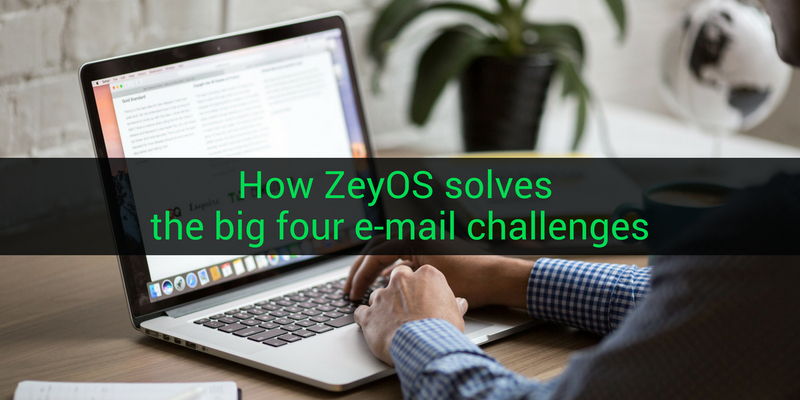 Let's see how ZeyOS is already solving 4 of today’s biggest e-mail challenges. As the amount of digital tools for communication constantly increases quite naturally the question arises “Does e-mail have a future?”. According to the report compiled by Statista the number of e-mail users worldwide amounted to 3.7 billion users in 2017. This figure is set to grow to 4.3 billion users in 2022. It means that e-mail is still an important means of communication especially in business and is far from being dead. The other question is “Will it stay the same?”. Most likely it will not, but more importantly it shouldn’t. E-mail communication has already changed a lot within the last couple of years and there are still many challenges that need to be addressed. We have selected four of biggest challenges in e-mail communication and would like to show you how these can be tackled by an intelligent ERP system like ZeyOS. The first challenge is e-mail sharing. For the most part, sharing is based on shared folders. With ZeyOS individual e-mails can be shared more easily. At ZeyOS, every important e-mail is shared within the group prior to sending for peer review. This way of sharing becomes even more powerful when taking outgoing e-mails into consideration. At first, labelling communication one of the primary e-mail challenges might sound more than a little bit strange. Isn’t communication the essence of what e-mails have been invented for? This is certainly true for external communication, but when looking at internal interaction, it becomes a totally different ball game. When scanning through your internal e-mails you will probably realize that a lot of those e-mails deal with other e-mails. Classic examples are forwarded messages with comments like „FYI“ or questions like „Who is going to respond?“, etc. Putting all these internal conversations back into e-mail, you are eventually making it harder for you and your team to (a.) identify important messages and (b.) come up with an internal consensus quickly. In ZeyOS, we are solving this issue by integrating the Mindlog module directly with e-mail. This allows you to discuss the content of an e-mail without doing any forwarding, etc. E-mails are usually written in the context of internal references to objects in your ERP system such as projects, tasks, invoices, products, opportunities, etc. In traditional ERP systems, e-mails are not part of this game, since they are stored in two different systems. Your business revolves around offers, opportunities, etc., yet your e-mail communication is totally disconnected from those objects. With ZeyOS, you can put your e-mail correspondence in context with those e-mails. The compliance and archiving requirements for e-mails are continuously increasing. Most e-mail systems do not meet the legal requirements regarding archive formats. In ZeyOS all your mails remain stored in a searchable database as well as a standard compliant format (RFC822). With the right system e-mail will become not only your number one tactic for building and nurturing relationships with your customers and partners, but also an effective tool of collaboration with your team. Peter is the CEO and co-founder of ZeyOS. When he's not with customers or writing code he is coordinating the team to get the job done: Creating the digital workspace of tomorrow.